The long awaited day arrived. 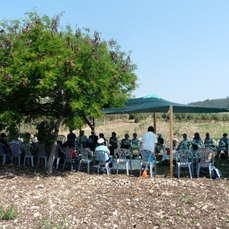 The sun was dancing amongst the trees as the bus took Galilee women, Jewish and Arab women who meet together every other month for worship, prayer and fellowship, to have their meeting in the nature this time, at House of Light Land. It was reviving for them to see the olive trees and the vine, some of them had planted many years ago, growing healthy and bearing fruit amongst the green mountains & woods. The brook continues to flow smoothly playing music, sweet to the ears and giving water to nourish the land. The women even tasted the land’s olives that had been picked last October and olive oil was added on the different salads. Praises and Prayers were lifted up for the Glory of the Lord and His presence was obvious in our midst as we re-assured the dedication of this Land HIS GLORY, trusting HIM that it will continue shining HIS Light to the surrounding villages.